It is every advertiser’s dream to have an international presence and expand business overseas, but how do you find the right markets to target in order to get the best return on investment? The Google Global Market Finder is the first significant step Google is taking to help advertisers answer this question and discover new opportunities internationally. This is an immensely powerful tool for the hotel and vacation industry, as now hoteliers have a vehicle for discovering untapped market share of potential new customers from all over the world. Choose from multiple different international regions you want to explore such as the European Union, G20 economies, the Americas, emerging markets, etc. Google Global Market Finder then does the rest. 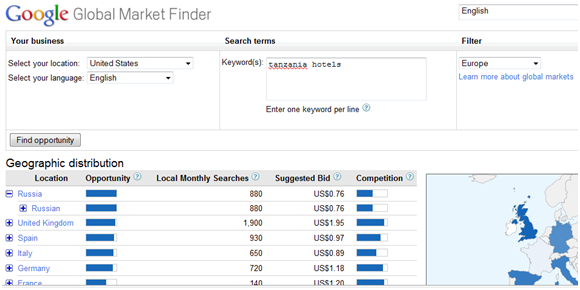 Your keywords will be automatically translated into the languages used by the markets you selected. The markets will then be ranked by opportunity, by combining search volume, suggested bid price, and competition for each keyword. With this type of information, hoteliers can then answer questions such as “how competitive is this market?”, “how does demand in one location compare to demand elsewhere in the world?”, and “how much would it cost to start advertising in this new market?”. From the data provided by the tool, not only will you will have sufficient information on which new countries show the most interest in traveling to your hotel location, but you will also have insight into the markets that demonstrate the most opportunity. For example, if you discover a location that provides high search volume but a low cost-per-click, this would be the ideal location to target. After deciding the new country to target, the next step would be to develop a marketing campaign that appeals to the interests and needs of the new market in order to fully capture and engage the new target audience.